Xander Bogaerts' RBI double in the top of the ninth inning snapped a 1-1 tie and helped lift the Red Sox to a 4-1 win over the Tampa Bay Rays at Tropicana Field Wednesday night. Joe Kelly was the winner with another scoreless inning of relief. He has not allowed a run in any of his last six appearances and has only allowed one run since giving up four on Opening Day. The Red Sox and Rays traded runs in the sixth inning and the game remained scoreless until the ninth. J.D. Martinez reached on a throwing error and was doubled in by Bogaerts. Rafael Devers walked, Bogaerts scored on a sacrifice fly, and Devers came in on a passed ball. 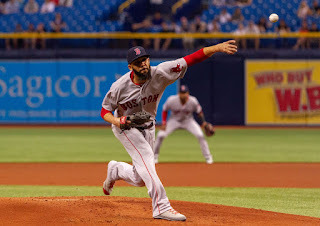 David Price (pictured) started for the Red Sox and went six innings in the no-decision outing. He allowed one run on three hits and three walks while striking out nine. Boston has won four in a row and seven of ten.